If you’re in the market for a new desktop wallpaper, we have 20 suggestions. A protoplanetary disk is the ring of dust and gas that surrounds a young star. As time passes, the material in the disk begins to coalesce into larger and larger objects, forming everything from asteroids to entire planets. Now, thanks to a powerful system of radio antennas in the Chilean desert, we have 20 stunning, high-resolution images of such systems — and they are more than desktop-worthy. These images are the work of the Disk Substructures at High Angular Resolution Project (DSHARP), a program of the Atacama Large Millimeter Array (ALMA), a massive system of radio antenna positioned in Chile’s Atacama Desert. According to the program’s website, its goal is to study the smaller objects in protoplanetary disks to determine how those objects related to planet formation. These images are helping it achieve that goal. According to a news release, the team was able to theorize based on this ALMA data that large planets can form much more quickly than previously thought. They also determined that the planets typically form far from their host stars. 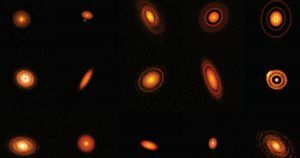 In addition to these gorgeous — and data-rich — images produced by DSHARP, just last week an international team of researchers published the preliminary results of a survey in which it used ALMA to image 32 stars surrounded by protoplanetary disks. Clearly, ALMA has proven to be one of our most useful tools for studying protoplanetary disks, and it’s only been operational for five years. Who knows what sorts of beautiful and useful data the array might produce in the future?